Almost entirely rewritten and reformatted with many more learning tools, this classic text now has even greater appeal to today’s students. This edition features much more discussion of how research methods are relevant for practitioners, and many examples are based on field research and service delivery scenarios. This comprehensive treatment of single-subject or within-subject design focuses on the strategic (the overall goal) and tactical (the methods and procedures) options available to investigators as they try to determine the most effective way of addressing research questions. The authors guide readers to consider the rationale for different ways of measuring behavior and designing experimental comparisons. At every point, the text explains the strengths and weaknesses of alternative choices so that readers can make the best decision in each situation. Rewritten in a straightforward and accessible style for students without a background in this area, this edition features many more field-based examples and applications. Increased focus on the application of research methods to the needs of practitioners in measuring behavior change and evaluating interventions under field conditions. Increased use of learning aids, including a “built-in study guide,” summary tables, figures, boxed discussions of special topics, key terms with definitions, chapter summaries, suggested readings, discussion questions and exercises, and a glossary. Instructor’s resource materials available on a password-protected website with digital access to figures, tables, definition of new terms by chapters, multiple choice test questions, and content from the book’s learning aids, including study guide questions and suggested topics for class discussion and exercises. 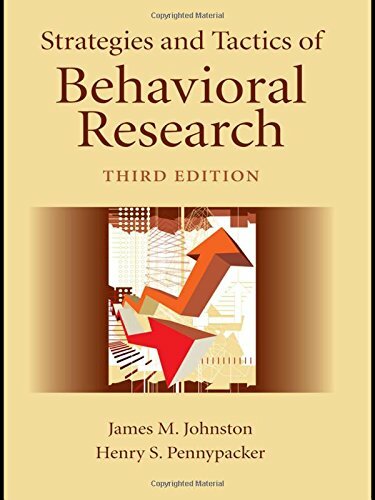 With a focus on direct behavioral measurement and within-subject design, this book is intended for advanced undergraduate or graduate courses in behavioral research methods, basic or applied behavior analysis, or single-/within-subject design taught in psychology (especially clinical and counseling psychology), social work, education, developmental disabilities, and other social and health science programs that deal with human behavior in research or practice settings. Although the book is written for students without a background in behavioral research, its comprehensive approach to designing procedures for measuring behavior and creating experimental comparisons also make it a valuable resource for investigators and professionals.